The historic summit is scheduled to take place on 12 June, but many details are still unconfirmed. It will be the first meeting between a North Korean leader and a sitting US president. Mr Trump said on Tuesday that plans were “moving along very nicely”. “A lot of relationships being built, a lot of negotiations going on before the trip,” he told reporters. White House press secretary Sarah Sanders confirmed on Twitter that the summit would take place at the five-star Capella Hotel. But it appears that the two leaders will stay elsewhere. Mr Trump will likely be at the Shangri-La Hotel, where US presidents have stayed before, while Mr Kim will probably stay at the St Regis Singapore, the Straits Times newspaper reports. The two hotels are on the main island, near the famous Orchard Road shopping strip. Sentosa is one of 63 islands that make up Singapore. The 500-hectare island, only a short distance from the main island, is home to luxury resorts, private marinas and plush golf clubs. But the island also has a dark history of piracy, bloodshed and war. Singapore was established as a British trading post in the 19th Century. Its prime location on the major sea route between India and China made it an ideal location. But even before British rule, Singapore was a flourishing trade centre, frequented by merchants and traders, as well as pirates. Sentosa was known at that time as Pulau Blakang Mati, which directly translates as the “island behind death” – a reference to its violent piracy reputation. The island’s population was mostly Malay, Chinese and the Bugis – seafarers originally from the Indonesian island of Sulawesi. Singapore fell to the Japanese in 1942, after British colonial forces surrendered. It was given a new Japanese name – Syonan, meaning Light of the South. Over the next few years, thousands of people were killed under an operation to purge anti-Japanese elements from the ethnic Chinese community. Chinese men between the ages of 18 and 50 were summoned to various sites before being machine-gunned to death and thrown into the sea. Among the massacre sites were the beaches on Sentosa, now overlooked by the Capella hotel where Mr Trump and Mr Kim will meet. Sentosa also hosted a prisoner-of-war camp, which held some 400 Allied troops and gunners. In the 1970s, the Singaporean government renamed the island Sentosa, meaning “peace and tranquillity”, and began developing it as a tourism site. But the island’s problems continued. In 1983, two carriages on the tourist cable car plunged into the sea after an oil drilling vessel struck the ropeway. A water park was opened – Fantasy Island – but was plagued by safety complaints. An eight-year-old girl died there in 2000 when her raft overturned. The park closed in 2002. Sentosa has since re-invented itself as the “State of Fun”. A Universal Studios theme park, a new water park and the Resorts World casino draw in thousands of Singaporeans and tourists each year. 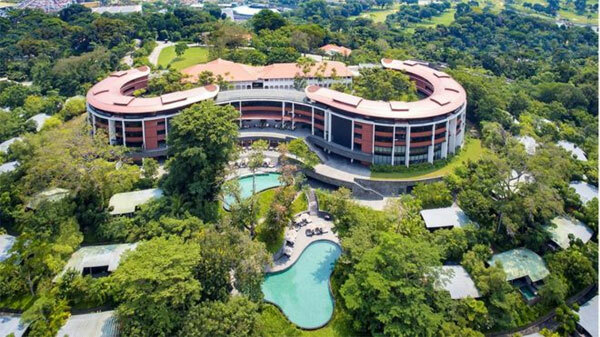 The 30-acre, 112-room Capella resort, nestled in tropical rainforest and designed by the firm of renowned British architect Norman Foster, features several grand colonial-era buildings. It describes itself as a place “where old and new fuse together in luxury”. Rooms are on offer from about $500 a night (£370) for a Premier Garden King Room to $7,500 a night (£5,600) for the Colonial Manor with three bedrooms and a private pool. White House staff have already had a preview of the venue, with Deputy Chief of Staff for Operations Joe Hagin and other officials staying there as they have hammered out the details of the summit. However, visitors hoping to grab a ringside seat will be disappointed. There are no rooms available from now until 15 June. Sentosa is home to one of the country’s most prestigious residential enclaves Sentosa Cove, where multi-million dollar homes with yacht docks can be found. Golf courses also litter the island along with some of Singapore’s most luxurious hotels and a handful of Michelin-starred restaurants. The island’s location, just off the mainland, makes it a secure venue. Access to the island can easily be secured – there’s just a cable car, a monorail, a pedestrian causeway and a vehicle tunnel. And should the world leaders want a break from their historic talks, did we mention the golf courses?